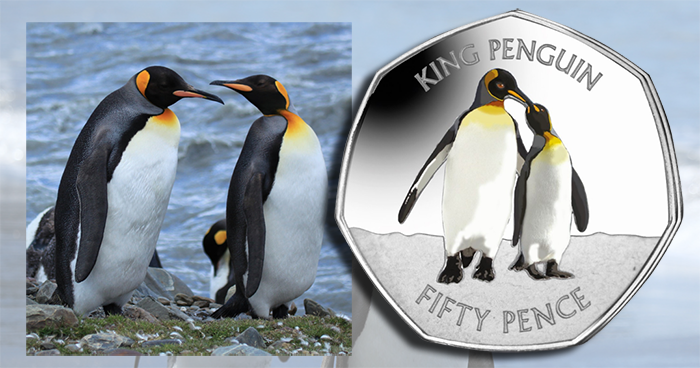 The government and treasury of the Falkland Islands have issued (24th July) their latest coin in their hugely popular series of four coins highlighting the wonderful world of penguins—a species of bird found in significant numbers in the South Atlantic. 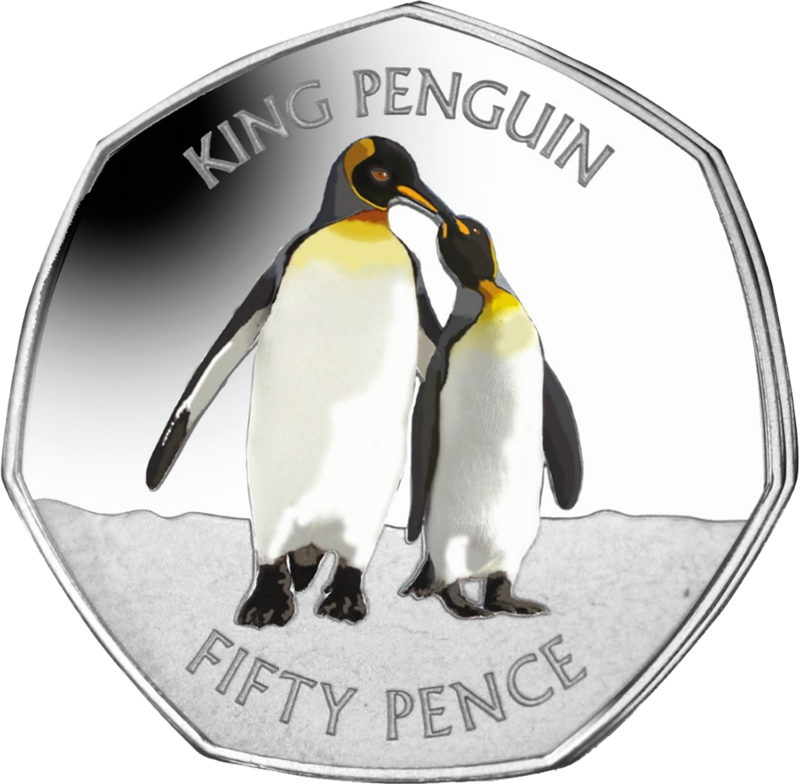 The coin, which is the third in the series, features the king penguin, a very large species of penguin and second only to the emperor penguin in size. These extraordinary flightless birds reach a height of about 100 centremetres (almost 40 inches) and weigh up to 18 kilograms (nearly 40 pounds). They sustain themselves on a diet of small fish and squid, which they can dive to incredible depths of over 100 metres (more than 300 feet) to catch. The plumage of the king penguin is similar to that of the emperor penguin, with a contrasting vivid yellow/orange patch at the top of the chest. The king penguin has this same orange on its cheek patches, which are much lighter than those on the emperor. The king penguin is found on sub-Antarctic islands such as the Falkland Islands. The Falklands actually refer to themselves as the “penguin capital of the world,” as more than 1 million penguins nest on the islands, together with the overall population, which—currently at 2.2 million—is actually increasing. Similarly to other penguins, the king has two groups of predators: those who eat their eggs, such as petrels and skuas, and those who hunt adult penguins, such as the leopard seal and the orca. King penguins typically start to reproduce at the age of about six, and they are serially monogamous, which means that each year they will have one partner that they will stay faithful to. The seven-sided coin with a vivid colour application on the reverse is produced by the Pobjoy Mint, United Kingdom, on behalf of the Treasury of the Falkland Islands. The reverse design features a large, adult male king penguin with his smaller female companion lovingly touching their beaks. The obverse features an effigy design of HM Queen Elizabeth II which is an exclusive design to the Pobjoy Mint. This coin is enclosed in a capsule inside a blue protective branded pouch. A collector’s album for the set of coloured penguins—illustrated with the penguins around a bait ball—is also available and is sold separately. The album also gives important facts and information about the individual penguins. Delivery commenced from the 1st August; the website also has a notice that orders placed between the 28th July and the 10th August will be shipped from the 11th August, as the office is closed while staff attend the ANA World’s Fair of Money in Denver, Colorado. The remaining coin in the series is scheduled to be released in October and will feature the magellanic penguin. 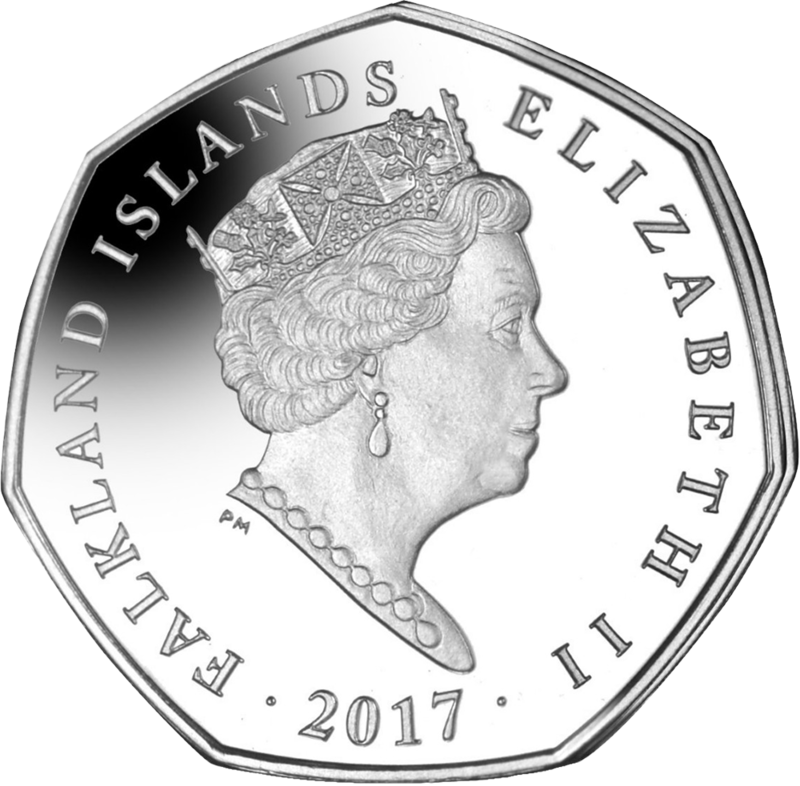 For additional information on this and other coins issued by the government and treasury of the Falkland Islands, please visit the website of the Pobjoy Mint.